Now ChordBuddy fits larger classical guitars. For classroom or home and based on the best-selling ChordBuddy for electric and acoustic guitar (#139936) pack, this new device fits onto classical guitars whose necks width is about 1-7/8″. Once this is attached you will be able to make music instantly. 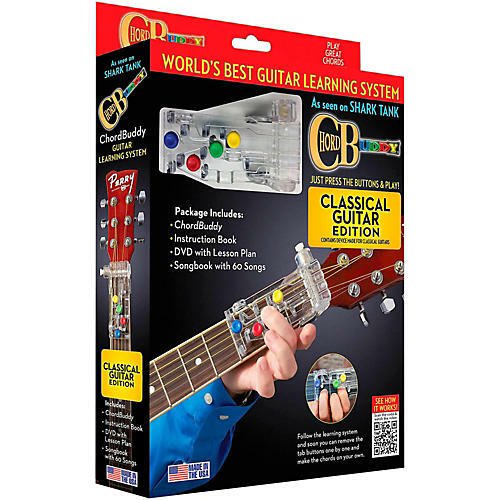 This complete learning system now features a color-coded songbook with 60 popular songs, updated DVD, and instructional method that shows you how to eventually remove the levers and form traditional chords. The ChordBuddy plays in the key of “G” and makes the “G” “C” “D” and “Em” chords.